Giesbrecht has crafted devotions for 31 days, each one centering on a name of God. She gives us information about the name, related Scripture references, and a prayer. Her desire is that readers would not only read the information but also use the devotion as an opportunity to experience God. We learn about God as our provider, protector, sustainer, shepherd, sovereign, healer, and much more. Many of the names will be familiar to those who have read other works on God's names, such as El Roi, the God who sees. Giesbrecht recounts the story of Hagar and the use of the name, reminding us that God sees everything, knows everything, and understands everything. There are some names that might not be as familiar, such as El Olam, highlighting the eternal nature of God. This is a good book for those who have not studied the names of God and the character traits they represent. The devotions are very readable and practical. Giesbrecht shares her own experiences, helping readers engage in the reality of experiencing God. She also includes a prayer with every devotion. The prayers are a practical way to put into practice incorporating God's character traits into daily faith. The devotions are two to three pages long and are very encouraging. This book would be a good choice for a month long emphasis on God and His character traits. There are no passages to look up nor questions to answer so each devotion can be complete in a few minutes. It would be easy to apply the devotional to the various areas of life. Go here to enter a drawing to win one of ten copies the author is giving away. Sheryl Giesbrecht is a radio personality, author, and speaker. She served as Focus on the Family's columnist for Pastor's Wives for four years. Her articles and devotions have appeared in many magazines. She also contributes to Crosswalk.com and is a regular blogger for BibleGateway and Lead Like Jesus. She is a missionary with International Christian Ministries and is the founder of Transformed Through Truth, Inc. She has a B.A. From Biola University, a master's in ministry and a doctorate in theology. You can find out more about her and her ministry at www.FromAshesToBeauty.com and www.TransformedThroughTruth.com. Bold Vision Books, 112 pages. You can purchase a copy here. Mills has given us a complex FBI suspense novel. The plot and motives were so intertwined I knew who the bad guy was near the end but had no idea why he did what he did. The lead female character is Stacy, a veterinarian who finds a body on her Saturday ride as a Houston airport ranger. Along with the body is a dog and a drone that has been shot up. Mills says in a note that there are such rangers, volunteers who ride the many acres surrounding the airport, checking for illegal activity. Enter the FBI in the form of handsome Alex. He's a special agent assigned to the case. Finding the disabled drone brings in the possibility of terrorism. But the dead man seems to have no background leading to terrorism and the dog was not his. Mills has added a couple of extra aspects to the plot. One is Witt, a twelve year old with an IQ of 147. His parents are totally irresponsible and abusive. Stacy is working on adopting the young man. Another is a deadly and contagious disease Stacy unknowingly introduces into the community. We find out that the disease is part of the complex plot and motive structure. I was a little surprised that this was the first in a series. Stacy has been estranged from her parents and is now trying to reconnect. Alex had a investigation where he trusted a woman who subsequently betrayed him. These two aspects of the characters' past have an impact in this novel and I would have liked to know a little more about both situations. I recommend this novel to readers who enjoy an FBI suspense novel with engaging characters and a complex plot. You'll learn a bit about airport protection and dogs and their diseases. DiAnn Mills is a bestselling of several romantic suspense novels. She has won two Christy Awards and been a finalist for the RITA, Daphne du Maurier, Inspirational Reader's Choice, and Carol Award contests. She and her husband live in Houston, Texas. You can find out more at http://www.diannmills.com/. I have been reading J. A. Jance for years, beginning with her Beaumont novels set in Seattle. It took me a while to appreciate her novels set in Arizona but now I'm hooked. Whether you've read the previous Joanna Brady novels or not, those who like reading police procedure mysteries will enjoy this one. Jance deftly includes background material so this novel can be read as a stand alone. I like Joanna Brady as a sheriff. She is a gutsy woman. In this novel she is pregnant with the latest addition to her family while her oldest is off to college. She already has much on her plate when a double homicide is revealed. Joanna uses her staff and her own efforts to find out why two women were thrown off a nearby peak. Jance gives us a good combination of personal interest and police adventure. We have come to know Joanna and her history. Here she is dealing with the recent deaths of her mother and stepfather, preparing for the memorial. We see an additional aspect of Joanna's strength as she handles that while working on the homicides. I like the characters Jance has woven into Joanna's ongoing story. Her second husband, the first having died, is an amazing man. He supports Joanna and her work without reserve. And then there is Marliss Shackleford, Janna's nemesis and irritating newspaper reporter. How Joanna handles her in this novel shows Joanna's growth as an elected sheriff. I was pleased to see Joanna's increasing reliance on her Christian faith too. I recommend this novel to those who appreciate learning about southwestern Arizona while reading a good police procedure mystery with a good deal of suspense. You can read or listen to an excerpt here. J. A. Jance is the bestselling author of the J. P. Beaumont series, the Joanna Brady series, and other novels. Born in South Dakota and raised in Bisbee, Arizona, she and her husband live in Seattle, Washington, and Tuscon, Arizona. You can find out more about Jance and her books at http://www.jajance.com/index.html. Perhaps you know someone struggling with PTSD. Maybe it is your spouse or family member. O'Brien has written an insightful and very practical book for spouses and friends of those experiencing Post Traumatic Stress Disorder. O'Brien lets us know that there is no easy solution for those in a relationship with a veteran with PTSD. She has found a principle consistent for a successful relationship, however. It is faith (connection with God) and love (connection with others) that heals and nourishes the relationship. She explains PTSD, reminding us of the horrendous atrocities vets experience. They get locked in an emergency mode, living as if the original trauma might occur at any moment. She also describes the difficulties living with a person experiencing PTSD and suggests steps to get back to where one is not hijacked emotionally. One may not ever get over PTSD, but one can learn how to handle it better and have good relationships in spite of it. O'Brien has included practical information for those living with vets. She writes about things that might trigger a PTSD experience, such as weather. She has tips for spouses when vets insist on having guns in the house. She includes ideas for expediting processes at government agencies. She also includes a section on wisdom gleaned from people who love their vets. She shares the thoughts of many and this really gave me a sense of what others are going through. For the spouse of a vet, this is good encouragement to know that you are not alone. O'Brien sums it up: “You may always have to walk on egg shells to some degree. Don't let it stop you from living and being you.” (171) There is a great deal of practical information and encouragement in this book to do that. There is a limited discussion guide included. 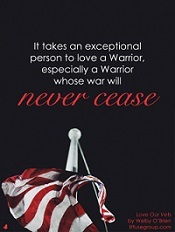 You can also find out more about the book at www.loveourvets.org. You can watch an interview with Welby O'Brien here. I am taking part in a blog tour of this book and you can read other reviews here. Welby O'Brien holds a Master's Degree in counseling (Portland State University) and a teaching degree (Biola University). She has written or contributed to several books, is the founder of Love Our Vets support network, and is the wife of a veteran with PTSD. You can find out more about her and her books at http://welbyo.com/. Deep River, 225 pages. You can buy a copy here. This novel reminds me of the complex spy novels of decades ago. The Russians are pitted against Americans and there is a secret group of powerful people working to take over the world. Our main character is a flawed hero. An investigative reporter with a hit show, Jack falls apart on air, pursuing the conspiracy surrounding the death of a man he sent to investigate a strange and sometimes humming sound in Russia. Fast forward to Jack married and on his honeymoon. Little does he know his wife has brought him to a remote Alaska ski area because of her own investigations. Conspiracy lovers will enjoy this novel. It is full of complex characters and plot twists. There are underground super secret facilities in the Alaska mountains. There is a spy from the Cold War who is still working with a group to establish a New World Order. There are lots of suspects as Jack tries to figure out the good guys and the bad. There is even a secret code that needs to be discovered and figured out. The plot in this novel is quite complex. There are many characters to keep in mind and many of them are not who they pretend to be. There is plenty of action, some of it the kind one only finds in spy novels. I recommend this novel to those who enjoy an involved contemporary spy story with roots back in the era at the height of the Cold War. Mark Hosack is the author of this novel and Identity. He writes screenplays and lives in Los Angeles with his family. You can find out more at http://markhosack.com/. Wide Awake Books, 324 pages. Is Earth special or is it just one of many similar planets? Is the fact that various life forms thrive on Earth a happy coincidence or evidence that the planet was specially designed? Ross presents recent and new information on the number and complexity of the features essential to human existence, originating in a variety of scientific disciplines. He shows that Earth is an exceptional planet with an exceptional history, resulting in an abundance of life and a variety of species. Ross goes into detail about the formation of the moon and the solar system, the requirements of habitability on Earth, the precise timing of the required gases and tectonic movements, the amount of sunlight required at various stages, and much more. There are nearly 40 pages of footnotes, showing how many scientific articles Ross has used. Ross suggests it is no accident that Earth is in the best possible location in the cosmic neighborhood for life's existence and survival. The number of factors that had to come together, the sheer difficulty of life developing on earth, is amazing. That God planned and prepared Earth for humans seems a reasonable explanation. Ross argues that a power and intelligence beyond nature is the most reasonable response to the question of the leap from nonlife to life. The information in this book may be a bit technical for some readers. Nonetheless, this is an important book on the continuing developments in the investigation of the origin and survival of life on Earth. Ross makes it clear that when one truly investigates all of the scientific literature available, it is reasonable to conclude that something or someone beyond ourselves had a hand in the formation of Earth and the development of life. I highly recommend this book to anyone interested in origins. Hugh Ross (PhD, University of Toronto) is founder and president of Reasons to Believe (www.reasons.org). He is an astronomer and a member of the pastoral staff of a church near Caltech. He has addressed students and faculty on over 300 campuses in the United States and abroad on a wide variety of science-faith topics. He is the author of several books and lives in the Los Angeles area. Scott thought “having it all” would lead to a fulfilling life. But successful dancing and acting careers left her feeling unfilled. She even tried New Age spirituality and self-help books. Nothing took away that need for Someone bigger than herself. Then she became a Christian. Scott shares her own experience of still struggling with bulimia, a remnant from her teenage dancing days. Crying out to God, she sensed Him telling her she had too many counterfeit comforts. When she experienced disappointment or discomfort, she did not run to the Holy Spirit for comfort but something else, usually food. Scott shares with us how we can be set free from those things that deceive and control us. She writes about choices, the Holy Spirit giving us opportunities to decide. She realized God was not going to make the decisions for her but He would be right along side her. She recommends journaling and being transparent with God. She shares her “on the floor” times when she is open to God, asking Him to show her the roots of her behavior. She includes teaching on spiritual warfare, the process of spiritual growth and the tools we have been given. I really liked this book. Scott is very practical with her suggestions for spiritual growth and healing. She shares many of her own experiences so we have an idea of how the process works. I highly recommend this book to those who want to know how to recognize counterfeit comforts and deal with them. You'll find great encouragement and good strategy here. Robia Scott began her professional career at the age of sixteen as a dancer and actress in Hollywood. After twenty years in the industry, she walked away from it to follow her calling to ministry. Her ministry specializes in helping believers appropriate all God has promised. She and her husband are the founders and senior leaders of Deeper Life Church in Redondo Beach, California. They live in Orange County with their daughter. You can find out more at www.robiaministries.org. Like many of us, DuPont had family pets in childhood but had spent two decades of adulthood without pets. Then a marriage, a move to Michigan and a stray cat changed that. DuPont, adopted, had been trying to find her birth mother. She did manage to see her but never meet her. Letters to her went unanswered. She received word that her birth mother had died right around the time the first stray cat, Kit Kat, showed up. The cat helped her through the emotional process. DuPont also relates how the two cats they took in helped her with her anxiety issues. Holding the cats and rocking with them in her lap was very soothing. This is a good book to show the connection we can have with animals and the healing opportunities they offer us. As a person with a few cats in the house myself, I enjoyed all the fun stories. The DuPonts had tried to leave the cat at another farm, and that the cat would travel eight miles back to them was amazing. I also learned a few things about cat care, such as the technique to use when moving to a new house. DuPont's writing style is soothing. There are no particularly well crafted sentences that stood out. There is just the gentle and thoughtful account of how cats helped her heal areas in her life and provided a great deal of satisfaction. I recommend this book to cat lovers or those considering getting a cat as a household pet. Lonnie Hull DuPont is an award-winning poet, book editor, and writer. Her poetry has been nominated for a Pushcart Prize, and she is the author of several books of nonfiction, including five compilations of animal stories under the pseudonym of Callie Smith Grant. A member of the Cat Writers Association, she lives in rural Michigan with her husband and their cats. Alexander has given us a story of God's grace and second chances. The novel opens with Dani Prescott is stalking Brett Somers. His parents died in an airplane crash in which Dani's mother, the pilot, also died. He had said some pretty harsh things about the pilot, claiming the fatal accident was all her fault. Dani is out to cause him the same amount of hurt he has caused her. Brett sees her across a street and the two meet. He is immediately attracted to her and they start spending time together. She might believe he is a nice man and a budding romance seems in the future. One aspect of the novel I found a little disconcerting was reading so much about Brett's previous self. He is a wealthy man and has bedded many women. He even belongs to group of men who get together to compare their conquering behavior. Brett has been shocked to find out he has a son and that seems to set him on a more moral course. There is a time, later in the book, when he is presented with the forgiving and saving grace of God. I just felt there was too much about his philandering past included in the story. Dani is a deceptive character. She keeps her real motive for being in the city to herself, lying to Brett. She keeps thinking she needs to tell him the truth but never does. I didn't have much respect for her character because of that. I found the plot a bit confusing. I have not read the first book in the series and it seems what happened in it is essential to know to understand this novel. I would recommend you read the first in the series before this one. I like to learn something when I read a novel and there was a little about the underground railroad in this one. I wish there had been more. Those who enjoy a somewhat predictable romance and won't be bothered by the many references to Brett's unsavory past may like this one. Johnnie Alexander is an award-winning author, an accomplished essayist and poet. She lives near Memphis, Tennessee. You can find out more at http://johnnie-alexander.com/. Daniel was tired of feeling responsible to apologize for everything done by anyone who called themselves a Christian. She shares her thoughts on the kind of spirituality she embraces and promotes. She writes about inventing our own spirituality, Fundamentalists defining religion, listening to NONES and attracting them to church and convincing them of the value of faith and community. She explains how exclusive salvation views turn people off. She advocates paying attention to the entire Bible, not just proof texts. Daniel emphasizes how we live, not what we believe. “I'm a pastor,” she writes, “and I don't care what you believe. I don't think God does either.” (121) She draws our attention to what Jesus said and did, not doctrine. While I don't agree with much Daniel writes, I do appreciate that she draws attention to “Christendom” and the negative effect it has had on the perception of Christianity by many. I also appreciate her emphasis on what the church should really be doing, helping one another in community. This book reminded me that Christianity is a broad spectrum. It also reminded me that it is important I know what I believe and why I believe it. Those within the more conservative Christian community might want to read this book to understand how the liberal Christian community thinks, worships, and ministers. There might be a good discussion resulting as to what really defines a Christian and what communities of faith are to be doing. Lillian Daniel is an editor at large for the Christian Century Magazine, and a contributing editor at Leadership Journal. She has taught at Chicago Theological Seminary, the University of Chicago Divinity School and at her alma mater, Yale Divinity School. A frequent speaker around the country, she has preached at the National Cathedral, Duke Chapel, and the Festival of Homiletics. She is currently Senior Minister at First Congregational Church in Dubuque, Iowa. You can find out more at http://www.lilliandaniel.com/. This is the second novel featuring Detective Inspector Jago investigating crimes during the London blitz. It's a well written historical novel I enjoyed reading. Jago is called out when the body of a young woman is found on rubble from a recent bombing. The pathologist concludes she was strangled and Jago sets off to discover the murderer. This is a good mystery. The plot is a bit complex as there are many who do not tell the whole truth right off and the identity of one character may be more confusing than meets the eye. I really liked the way Jago methodically goes about finding out the truth. There were a number of possible suspects, right up to the end. The strength of this series, though, is the historical aspect. Hollow notes that an actual historical event prompted the writing of the novel. I really like how we come to know the complex attitudes of people during WW II. Some thought the Germans were causing trouble because of how they had been treated at Versailles, with all the reparations forced on them. Some distrusted the news reports from England's government and put more store in what they heard from the English speaking German radio service. After France had fallen, some were sure England was going to be invaded shortly. I really like this detective series. The characters are well crafted, the novel itself is very informative, and the plot held my interest. I recommend it to those who enjoy a well written historical British mystery. You can find out more about the novel and the Blitz Detective here. Go here to read my review of the first book in this series, Direct Hit. Mike Hollow was born in the Essex County Borough of West Ham, home of the Blitz Detective. He studied Russian and French at Cambridge University and worked translating for the BBC. He then worked with Tearfund, traveling widely. In 2001 he went freelance as a writer and translator. Lion Hudson, distributed in the U.S. by Kregel, 330 pages. We need to start each morning having a conversation with God. Veerman has drafted a collection of morning prayers to encourage us to have that conversation every morning. There are 365 prayers but they are not dated. One could begin using the book anytime. Each reading has a title, the prayer, and then the Scripture relating to the prayer. There is generally a prayer a page but weekend prayers are shorter with two to a page. This is a great devotional for Christians who have difficulty praying. Veerman's prayers are good examples of how to pray. They are written with insight and show a good understanding of Scripture. Some prayers reflect promises we can claim while others convey the necessity for action on our part. Some of the prayers are short lessons in theology, praying about a Scriptural truth. One could use this book by going from the beginning to the end. Each prayer is on a different topic and there is a good topical index at the end so one could also look up a subject and use the prayer for that day. I found that more useful than just going day by day through the book. As is often the case with written prayers, some just did not seem to apply to my situation. For example, one prayer was about having to make an important decision, something not on my horizon. Those prayers were few, however, and even they inspired me to pray about others and their situations. I don't usually use written prayers but I generally liked the ones in this book. There are some mornings when I just have trouble getting started praying and this book has helped a great deal. It always gave me inspiration to pray more after I finished the one in the book. I recommend this book to those who need some inspiration to start their day with prayer. You can preview the book in PDF form here. Dave Veerman is a senior editor of the Life Application Study Bible. He has authored seventy books and has served twenty-six years with YFC and is a founding partner of Livingstone. He and his wife live in Illinois and have two grown daughters and five grandchildren. Collins has received prophetic messages from God to encourage believers. He has divided the material into 90 days of readings. Each daily reading includes a Scripture verse, a message related to that verse, additional Scripture references, a prayer, and statements to decree and declare. The messages Collins includes are written as if God is speaking to the reader. It is an awesome responsibility to write as if God is speaking. I was pleased to see that the messages generally follow Scriptural truths about being loved, protected, being more than a conqueror, etc. Some are admonitions, such as the one where the reader is commanded to get wisdom and understanding and another to be grounded in the Word. Some of Collins' messages I think might be a bit much. “Be confident that you can do whatever you make up your mind to do.” (91) I would prefer messages concentrating more on finding out what God wants me to do rather than what I make up my mind to do. I am a little leery about some of the decrees. For example: “I decree and declare that monies, bonuses, benefits, favor with men, and blessings will come to me now in Jesus' name.” (91) “I decree and declare that I am healed and I am a miracle worker.” (212) I know there are some Christians who believe that making statements creates reality. This book seems to be aimed at such believers. I recommend this book to charismatic Christians who believe that declaring something makes it so. Hakeen Collins is a sought-after conference speaker and produces a weekly radio program called “The Voice.” He is the author of Born to Prophesy and is CEO of Champions International based in Wilmington, Delaware, where he lives. The plot and characters in this novel are well crafted. The novel is entertaining and informative. The main character is sort of an anti-hero. Raven entertains people on street corners of Atlanta with magic and picks their pocket while he's at it. Trouble comes to him when one of his victims has Ukranian mob connections. He has some tough visitors and they are not nice. Another prominent character is an older woman, Mama Bliss, who owns a huge store containing one of a kind items such as movie memorabilia. She has clout with policemen and mobsters alike. We find out that she handles merchandise much more lucrative than trinkets from by gone eras. Coffee and Hill are also characters in the novel but somewhat irrelevant. Most of the action centers around Raven as we learn his story and watch his encounters with mob people and Mama Bliss. I like to learn something when I read fiction and in this case it was a bit about Edgar Allen Poe's “The Raven.” Even more interesting to me was learning about laundering guns. The CIA would use private people to get guns to friendly nations without having to get the U.S. government involved. Individuals might even feel patriotic, providing untraceable guns for foreign wars, seeing themselves as helping to undermine and topple foreign governments. While there was much to like in this novel, overall, I am not excited about it. Both Raven and Mama Bliss are sort of anti-heroes. They are both law breakers and initially think nothing of it. Raven does have some redeeming action at the end but it was not profound. Much of the plot deals with revenge in and through mob connections. I found that a little depressing. I miss having a stronger Christian influence on at least one of the characters. The spirituality was somewhat vague. Raven's father was a minister and Raven could have had a spiritual realization about his life and actions but it was not meant to be. I recommend this novel to those who enjoy a well crafted plot and well crafted characters and don't mind the lack of a redeeming aspect to the novel. Mike Nappa is an entertainment journalist at FamilyFans.com, as well as an award winning and bestselling author with more than one million books sold worldwide. A former fiction acquisitions editor, he earned his MA in English literature and now writes full time. It is fall in Portland, Maine, when life usually returns to normal after the summer tourists. But when a retired cop is murdered, Detective Sergeant John Byron is tasked with investigating the case. On the outs with his department's upper echelon, separated from his wife, and feeling the strong pull of the bottle, Byron remains all business as he tries to solve the murder of one of their own. And then another ex-Portland PD officer dies under suspicious circumstances. Byron realizes there is much more to these cases than meets the eye. The closer he gets to the truth, the greater the danger for him and his fellow detectives. I thoroughly enjoyed this police thriller. I can tell Coffin knows police procedure, the politics of police departments, and the character of detectives. The plot, character action and dialog have that sense of authenticity from the very beginning. He starts out the novel with a murder that draws us into the plot right away. And the action continues, practically nonstop. Coffin does a great job with the interactions and dialog among the policemen (and women). My favorite part of the novel was Byron. He's a great flawed character. On the positive side, he is relentless in investigating a murder, no matter who in the department he irritates. On the negative side, he is fighting his addiction to alcohol and suffering through the loss of his marriage. I really liked how the plot was developed. The murders of the ex-cops have their origin in a police event from years ago. Byron unravels the truth bit by bit as he pursues the facts of the case. He has a personal interest in the case since his father, also a policeman, committed suicide shortly after that police procedure years ago. I recommend this novel to those who like an authentic police procedure novel full of suspense. I think readers of John Sandford and Michael Connelly would enjoy this book. It is a page turner that kept me reading way too late at night. I am taking part in a blog tour of this book. Click here to view the 'Among the Shadows by Bruce Robert Coffin' Tour Participants. You can read an excerpt here. Bruce Robert Coffin is a former detective sergeant with more than twenty-seven years in law enforcement. At the time of his retirement from the Portland, Maine police department, he supervised all homicides and violent crime investigations for Maine's largest city. Following the terror attacks of September 11th, Coffin spent four years working counter-terrorism with the FBI, earning the Director's Award, the highest honor a non-agent can receive. You can catch up with Bruce Robert Coffin on his website, on Twitter, and on Facebook. You can grab a copy of Among the Shadows on Amazon, at Barnes &Noble, or add it to your TBR list on GoodReads. I received a complimentary digital copy of this book through Partners in Crime book Tours for the purpose of an independent and honest review. Do you feel that life isn't supposed to be this way? Do you feel like you were made for more, for that abundant life Jesus promised? Hawkins has written this book because he believes “each of us can experience the more that God has for us right here, right now.” (9) He questioned half a million church attendees about their spiritual lives. This book contains what God revealed through that research. He found out that many of his assumptions about what produced spiritual growth were wrong. Involvement in church activities did not predict a greater spiritual growth, did not lead to greater intimacy with God nor one becoming a more loving person. He wrote a book for church leaders about those findings. But what about individuals? Hawkins talked with people who lived an abundant life. He found that intimacy with God was the key to that life of “more.” He gives six strategic changes in thinking and how we practice our faith that are necessary to live the life God intended. Shifts in thinking include leaving the kingdom of “me,” going from “me” to “we” (including God in you), knowing the Bible is essential to survival, knowing that we're dead, and there is only now. Changes in our faith practice include saying we're sorry to God (confession), times of stillness, building a web of relationships, being present in the moment and emptying ourselves. I am impressed with this book. Hawkins writes, “We were created for deep intimacy and oneness with God.” (51) He says it is something we cannot even imagine. But we can move ourselves toward that reality. Hawkins' suggested changes in thinking and faith practice rang true to me. The abundant life is available but we will not approach it unless we make some changes. I recommend this book to Christians who long for more in their spiritual life. Hawkins provides the framework but each believer must contemplate the changes in thinking and behaving. It is a continuing journey, he says. Each day, believers can have deeper intimacy with God and more abundant lives. Greg L. Hawkins is the former executive pastor of Willow Creek Community Church, where he served for over twenty years. He currently serves on the leadership team at Oak Hills Church in San Antonio, Texas. He and his wife live in the hill country with their children. Sozo is the inner healing and deliverance ministry headquartered at Bethel Church in Redding, California. The co-leaders of the ministry have written this book to help believers remove the lies that block the gift of God's abundant life. The authors explain that the gospel is more than salvation from hell. Believers are to have freedom, power, and love now. They explain the meaning of sozo, the essential nature of a strong relationship with God, forgiveness and healing wounds from the past, getting rid of lies and replacing them with the truth, closing the doors that allow demonic oppression, practicing discernment, and more. The authors have included a number of examples of sessions with sozo team members, including dialog and prayers. They explain the steps of the various aspects of the ministry so readers can go through the healing process themselves. Included at the end of each chapter are discussion questions, specific steps of action to take, and a suggestions for further reading. The authors remind us that we are engaged in a spiritual war. This book helps Christians to be participants in combating evil on a personal level. Readers must be willing to seek truth from God and accept it. We are also reminded that when we receive healing, it is our responsibility to walk it out. I recommend this book to Christians who want to know more about inner healing and deliverance. These ministries can seem scary and the authors have done a great job of explaining how it is done, including specific steps for readers. I highly recommend that this book be read within a group. The wisdom and insight of others while reading the book and following the steps would provide encouragement and protection. Dawna De Silva is the founder and co-leader of the International Bethel Sozo Ministry. She and her husband have ministered at Bethel for the last twenty years. Teresa Liebscher is the co-leader of the Bethel Sozo ministry headquartered at Bethel Church in Redding, CA. She is also the founder and leader of the Shabar ministry. She travels the world training, mentoring and ministering in both the Sozo and Shabar ministries. This is the third in a series but reads well on its own. To really appreciate the interaction between the characters, however, the earlier books in the series should be read. This story centers on Riley, one of the Callahan brothers. He had joined the Marines, a response to Paige, his best friend and the one he loved, dating his brother. Now he is coming back from his tour as an injured man, having lost part of a leg. Riley had every intention of telling Paige how he felt. But now, a damaged man, he is sure Paige would never want him as a husband. The majority of the plot deals with Riley's feelings. He struggles with his own self worth. He struggles with his love for Paige and thinking he should let her be free to marry a whole man. There are other aspects of the novel, such as the animal shelter Paige manages needing money. Those aspects, it seemed to me, were mostly filler. The plot itself is a little repetitive as Riley makes a decision, then changes, then changes back. I did appreciate the side story of Aunt Trudy, a reminder that we should appreciate love when the opportunity presents itself. I like to learn something when I read a novel and I was a bit disappointed that there wasn't more information about how Riley adjusted to life as an amputee. More about how a prosthesis is designed and fitted could be included. I would have liked to learn a bit about how an animal shelter is managed too. I recommend this novel to those who really like a romance that contains and is driven by thoughts and struggles of the characters. You can read my reviews of earlier books in the series, The Goodbye Bride and Falling Like Snowflakes. Denise Hunter is the best-selling author of over 25 books, one of which has been made into a Hallmark movie. She has won The Holt Medallion, The Carol Award, The Reader's Choice Award, The Foreward Book of the Year Award, and is a RITA finalist. She and her husband and their three boys live in Indiana. You can find out more at www.DeniseHunterBooks.com.